PROOF! Obama Not a Kenyan! Right parents? Check. Right birthday? Check. Right place? Check. Right baby? Check. Case closed. What a relief! 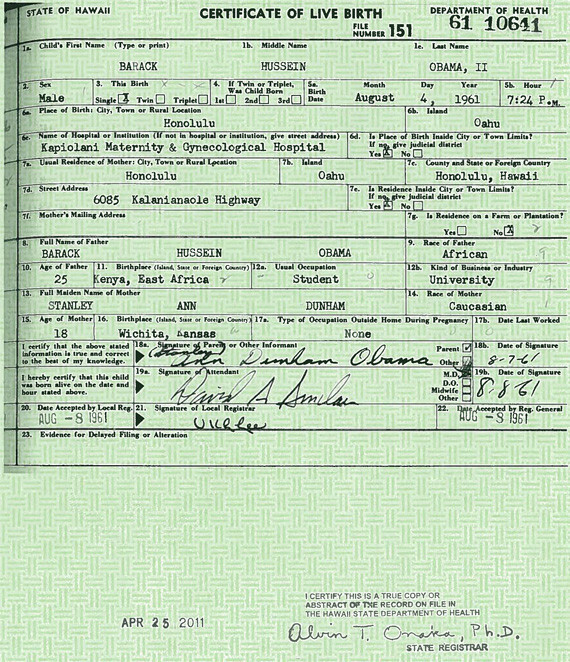 Our president has finally silenced the birthers by producing his original, long-form birth certificate from Hawaii. He is NOT an alien! President Obama called a surprise press conference this morning to take down the conspiracy buffs once and for all. He also went out of his way to give the doubters a mild whack upside the head. Well said. Now the president will merely have to contend with an unwinnable war in Afghanistan, a stratospheric federal deficit, the lingering recession, the Mexican border, viral unrest in the Middle East, lobbyists, hyperpartisanship in Congress, Wall Street excesses, mass foreclosures, the impending eclipse of the U.S. economy by China, and (of course) whether he really deserved to get accepted at Columbia with his allegedly so-so grades from Occidental. Please don’t ever ask me to run for President (not that anyone is beating down my door at the moment).